"Good evening. Perhaps I should explain this. My wife had these posters printed up as a joke. Of course she doesn't really want me. Anyway there isn't a chance that I'll be recognised; they're passport photographs. This one [points to profile photo] is for going abroad, and this one [points to photo showing the back of his head] is for coming back. 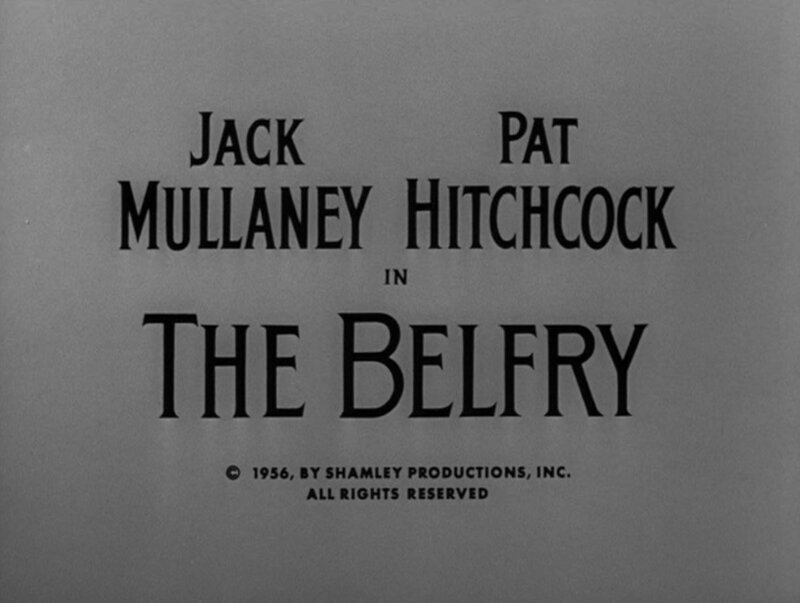 My excuse for making these undignified remarks is that tonight's story, 'The Belfry', contains a wanted man. In fact an entire town is looking for him. Such popularity must be deserved; and in this case it is. But I shall allow you to learn the details on your own. First however, I want you to hear this description of a much-wanted product. Listen closely: it may be in your neighbourhood store. If it is, apprehend it at once. The reward is high." 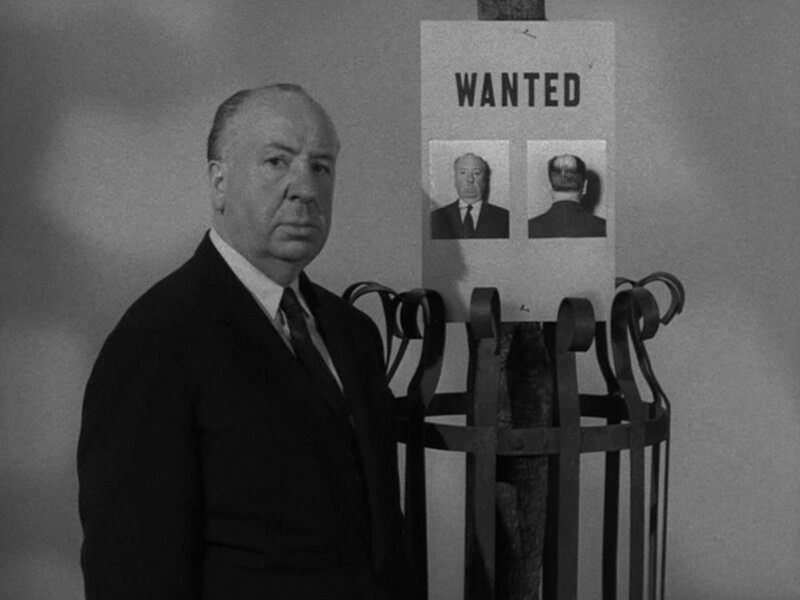 [Hitch has his back to the camera and is penciling a moustache over his "wanted" photograph before turning to the camera with a false moustache!] Good night." The bell rings at the top of the tower above Clark County School, which also doubles as a church, as we pan down to see all the kids running out of the building excitedly. The teacher, Ellie Marsh (Pat Hitchcock) locks up for the day when she is joined by Clint Ringle, who upon first impression seems like a simple, shy, stuttering man but whose manners prove to be anything but when she rejects his advances of proposed marriage. Her new fiance Walt Norton shows up but when he confirms his engagement to Clint, Clint suddenly kills him with an axe. The murder is seen by one of the schoolchildren who runs off to tell others of what he has witnessed. As night descends and the rain falls, the unhinged Clint walks around in a haze with the voices in his head reaffirming his love for Ellie and how he has it all planned out to build a house for them and a future together. 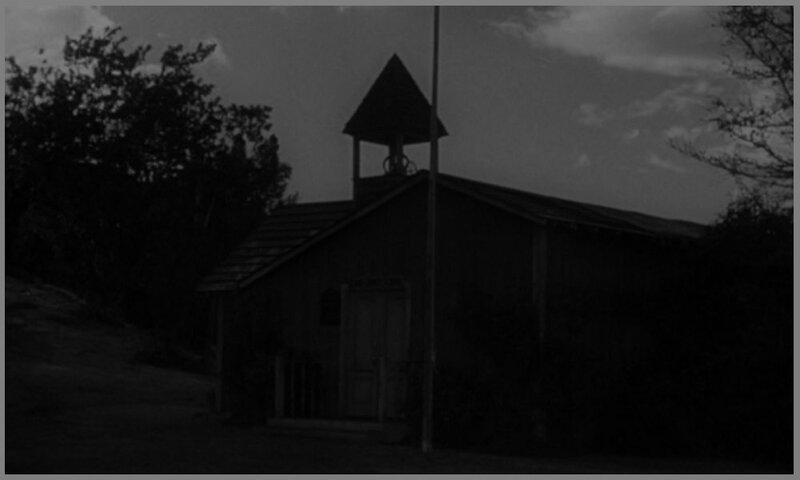 A search party hunts for Clint as he decides to take refuge in the belfry above the school house. The sheriff and the volunteers have a conversation downstairs inside the school house and within the earshot of Clint with the sheriff telling the men the first one of them to find the wanted man to come back and ring the bell. The next morning the hunters stop by outside the school house, which has now been closed on account of Ellie being at home disturbed by the events of the day before. When Clint overhears the men saying how Ellie referred to his house as a "shack" he becomes irritated and thinks less of her for mocking his efforts. We also see that Clint has stuffed his jacket up inside the bell to prevent it from making any sound in the event that somebody tries to ring it and give his position away. Clint climbs down and into the school house where he stumbles upon a book with Ellie's hand-written signature in it. He throws it in rage across the classroom before chalking "I'll git you to" [sic] on the blackboard. The next morning Ellie is teaching her class when she sees it and begins to freak out. Later, when the kids are playing outside one of them throws a baseball up and hits the bell. 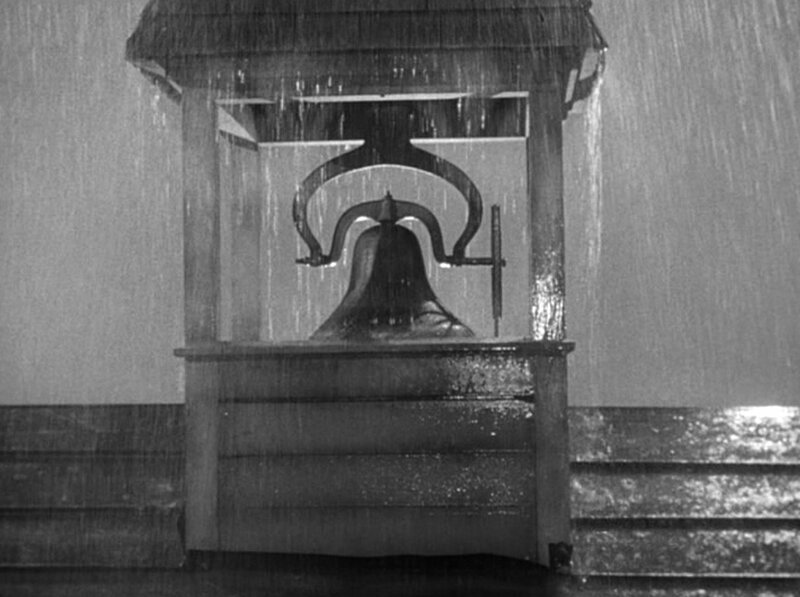 As the boy climbs up to retrieve it the bell begins to ring, signalling the children to go inside the classroom. That afternoon the end of school means Clint can now 'escape' from his perch but misses his opportunity to accost Ellie when the sheriff escorts her home safely.